Now offering yoga, pilates, HIIT, circuit training, core workouts and more! Our weekly yoga and group fitness classes are free for members (non-members can attend with a day pass or punch pass). 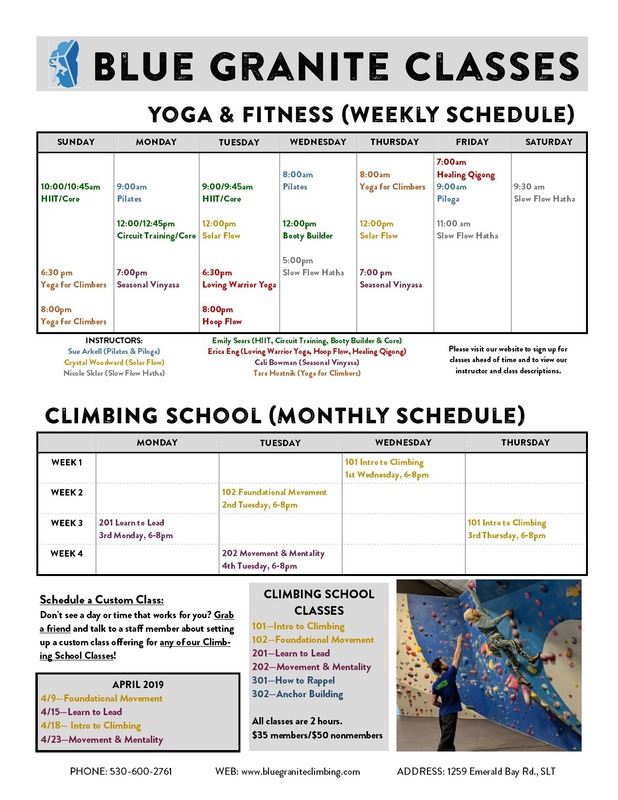 View our current schedule, class descriptions and instructor bios below. Take a pause mid-day and reset with a creative solar flow yoga class. This hour long class will begin with an energizing sequence, and will end in a long, relaxing deep stretch. All levels of experience are welcome and optional modifications will be given. Warm up with sun salutations and progress through a sequence of postures or “flows”. Classes will include: forward folds, back bends, side bends twists, core strengthening, and balancing poses. Class will conclude with deep stretches that target the muscles worked in that day’s flow. This class is adapted to follow the seasonal changes embodied here in the mountains. We will practice different postures including twists, stretches and core strengthening in order to align our physical bodies with the constant changes outdoors. All levels welcome. Fire up your core and start the day with exercises designed to challenge and improve your strength, flexibility, and coordination. With serious emphasis on core strength and skeletal stability, the Pilates method builds in intensity through a series of fluid movements designed to unite the mind and body. Modifications available to tailor to all fitness levels. Piloga is a fun and energetic combination of Pilates and yoga. Through a series of postures aimed at building strength and flexibility, this class is designed to enhance your performance as a climber. Learn how to integrate yoga on and off the mat, breath work to increase lung capacity, meditation to destress and conscious movement in this hour long class to keep you climbing on! Gain flexibility, strength, and peacefulness in this class that introduces you to ancient movement practices from the East: Yoga & Qigong. Learn the way of the peaceful warrior. Cultivate your life force energy and open your body & mind. In this playful style of vinyasa & traditional tantra Yoga, we focus on building strength, stretching major muscle groups, ensuring proper form and promoting relaxation. Taoist Medical Qigong is an ancient Chinese movement practice for self-healing using movements along the meridian or energy lines connected to the body’s organs. Class will have a warm-up and 8 primary sequences (all standing movements) that stretch and strengthen major muscle groups and allow for myofascial release. Learn how to hula hoop and/or refine your skills for beginners and experienced. Flow and learn sequences to increase your proprioception, ninja skills, tone arms and waist, and have lots of fun! This high-intensity intervals class will get your body moving and heart rate up, leaving you feeling accomplished. Get ready for 45 minutes of maximum burn! Hit all the stabilizing muscles, not just your 6 pack. If you want a tight core, better performance in a wide variety of areas, or need relief from back pain, this all-levels core strengthener is for you! Target your glutes, hamstrings, and quads through body weight and weight training. The result? A strong, balanced booty. This timed circuit workout focuses on strength training and cardio drills to get you stronger and raise your heart rate. Get ready to sweat and work your entire body along the way. Sue Arkell is a highly experienced fitness instructor with a resume spanning three decades of sports and fitness instruction. Sue has coached beginning to elite gymnastics on national and international stages, and has instructed Pilates, step, boot camps, and yoga classes. She is passionate about teaching students of all ages and walks of life. Climbing and yoga alike bring you into a flow state which leaves you feeling alive, aware and full of gratitude. In yoga we work to heal the body and heal the mind allowing the natural flow of energy to reinvigorate us. Cali believes in incorporating a holistic approach to all things, especially her yoga practice. She has been teaching yoga for over 10 years and practicing since she was a child. In each of Cali's classes you will get a chance to both strengthen and lengthen your physical body as well as calm the mind for more peaceful control of the senses.